Friendly and accessible, the new brand identity features a simple logo that is designed to help Bike New York raise its profile and become closely associated with biking in the city. Inspired by the straightforward visual icons of street signage, the letter-based logo is composed of stencil-like shapes that literally illustrate the organization's name: The letters "NY" form the frame of a bike. The mark is instantly recognizable and also remarkably easy to draw, so anyone can make it their own; the designers created a series of hand-drawn versions, which have been animated on the Bike New York website. Typography is set in Sharp Sans, with the wordmark appearing in italics for a sense of motion. 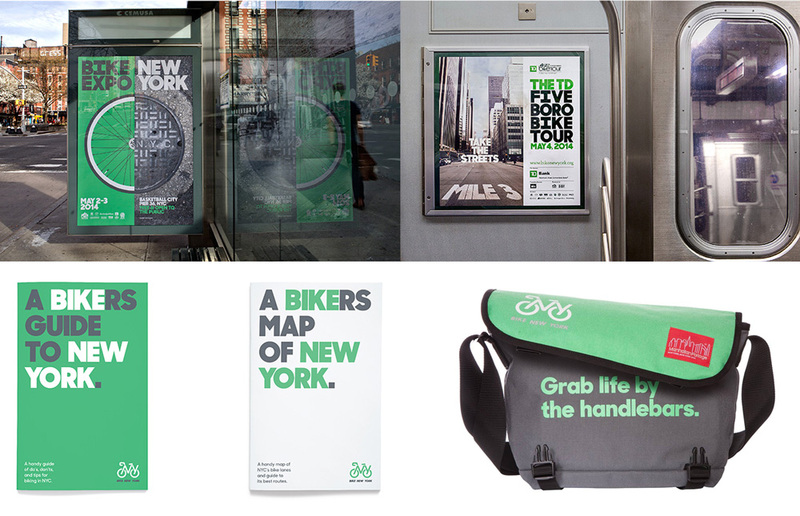 Oberman worked with Bike New York to reconfigure copy so the words that make up its name — "bike" and "New York" — can be set off in the messaging of various applications like riders guides and the Bike New York website. The color palette is inspired by riding in the streets: the program uses the same green as New York's bike lanes, accompanied by the slate grey of pavement, the yellow of lane markers, and for accents, a safety orange and a sky blue. A few different materials. A lot more can be seen in the video below. The previous logo was at its best a really dorky Tron bicycle look-alike but, at its worst, it was just plain awful. The new logo is a fun and clever reduction of a bicycle frame that incorporates "NY" into it. It's a little bit forced but it works really great and makes for a FedEx-arrow-like puzzle to solve. The wordmark (and identity) are set in Lucas Sharp's Sharp Sans, which, among other traits, has a delightful "R". The heavy type on the materials feels quite New York-y and the color palette is very smart in using the actual green used for the bike lanes and matching it with an asphalt gray. Overall, a great improvement that yields a bold visual presence for the nonprofit. \"Bike New York is a 5O1(c)(3) nonprofit that provides free bike education programs throughout the five boroughs. In 2O13 alone, they taught bike skills to more than 16,000 kids and adults. Funding for these programs comes from the organization's numerous annual events, including the TD Five Boro Bike Tour, Bike Expo New York, and smaller regional and local rides.\"